Trent University students are making waves in the business world with TrentWorks, the digital marketing firm that is re-launching with the guidance of FastStart. 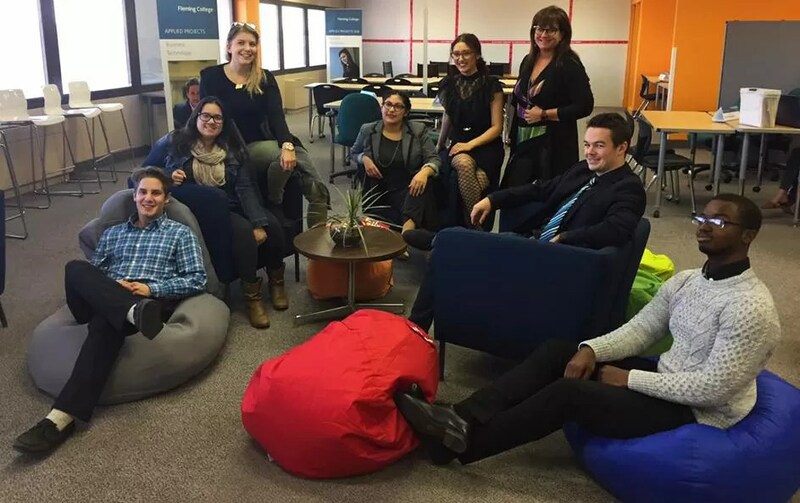 In 2013, Sofie Andreou & Associates launched the TrentWorks digital marketing firm with five Trent students. TrentWorks facilitates the employment of the brightest Trent students to help organizations leverage the power of the internet while helping launch their careers in digital marketing. It saw a great deal of success in 2013 and those students have since moved on in their career paths. Andreou will continue as the TrentWorks chair in order to ensure a smooth transition for the program. This year, seven undergraduates majoring in business and computer science are all eager to work with local businesses. These students have been hand picked and have all participated in Andreou’s Online Marketing class at Trent University. They will complete projects such as designing websites, content creation and integrated digital campaigns. FastStart, the youth entrepreneurship training partnership between Trent University, Fleming College and the Greater Peterborough Innovation Cluster, saw the opportunity to develop the students’ entrepreneurial skills. “Entrepreneurship can be a scary leap for most people. These students will be able to develop their entrepreneurial skills and gain clients in a safe and empowering environment surrounded by advisors and other entrepreneurs,” notes Rose Terry, Entrepreneurship & Marketing Coordinator. The TrentWorks headquarters will be located in the Cube incubator to allow for students to have meetings with clients and work with other business people in the community. To outsource your social media, digital photography, videography or websites, contact www.trentworks.com. Building the local economy is no small feat. When we think about local businesses, successes, and growth, we often remind ourselves to spend more of our hard-earned dollars at home to keep these entrepreneurs in business. Peterborough Dialogues interviewed our CEO Michael Skinner to talk about investing in community and growing the local economy. Peterborough is a great community for bringing people together, creating awareness, and reminding people to purchase from and invest in local businesses to eventually create jobs. “Every time we spend a dollar either outside of our community, or outside of our province, or outside of our country, is a dollar that could have been brought into our community,” says Michael Skinner. Businesses become very rooted in the Peterborough community and the opportunities to grow from within are here. Peterborough students who realize the potential in Peterborough would help decrease the ninety-some percent of students that leave post-graduation. The challenge of finding a specialized job in Peterborough for both spouses is evident, but we can work towards solving this problem by identifying the social side and lifestyle of Peterborough. “It’s important to continue to remind people of what our successes are and to continue to elevate them and bring attention to them,” says Michael Skinner. Click here to see the entire series! A local clean tech company is making waves across the world with their solution to clean water sources in remote areas, namely touristic areas. Rainmaker Worldwide Inc. provides innovative, environmentally friendly clean water solutions to communities and businesses struggling with water scarcity across the world. 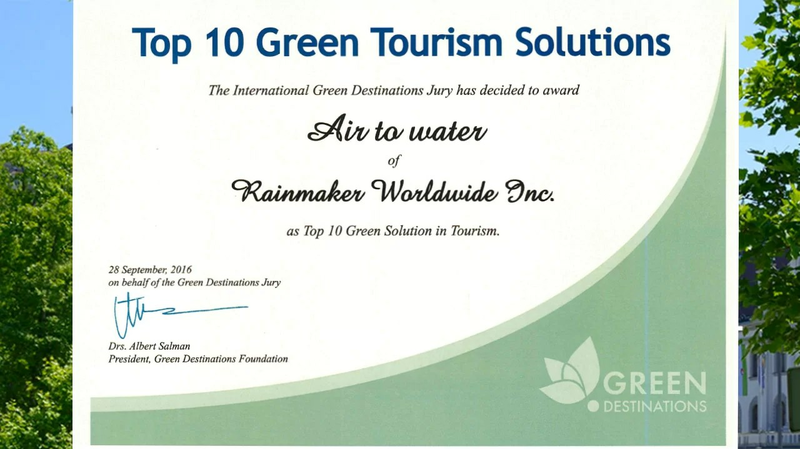 This week, Rainmaker Worldwide Inc. was named awarded as a Top 10 Green Solution in Tourism during the international event, Global Green Destinations Day held in Ljubljana, Slovenia. The Peterborough-based company won the award from Green Destinations for their Air to Water solutions, which harvest large quantities of water powered by renewable energy. 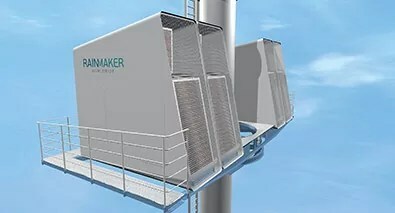 With their head office in Peterborough, Canada, Rainmaker Worldwide Inc. is growing quickly with a manufacturing facility in Rotterdam, the Netherlands, and authorized partners and stakeholders around the world. Without a doubt, Rainmaker technologies bring significant business and research and development activity to the Peterborough region and have a major impact on the communities in which their solutions are deployed. This Air to Water innovation is 100% sustainable and leaves no damaging footprint where it is placed; running completely on renewable energy makes this a positive environmental, social, and economical impact! This cost-effective solution has the potential to change the world, especially in dry areas where there is a lack of rain. Areas like this become attractive tourist destinations when companies like Rainmaker Worldwide Inc. are able to provide fresh drinking water. Other Air to Water systems exist in the Netherlands and Kuwait.